There is little worse than being an owner of a dog that suffers from this phobia, especially when the behaviour is extreme and behaviours such as running in circles, involuntary defecation and even those dogs that will go through windows, chew through doors and jump fences, in order to get away from the perceived threat are shown. The feeling for the owner can be one of utter helplessness. 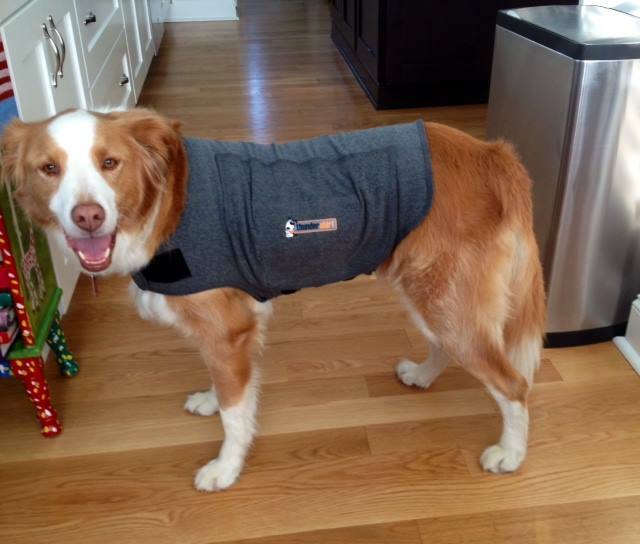 In addition to working with clients that have dogs that suffer with this phobia for many years, my own dog Brady became phobic due to 'one event learning' when the house was hit by lightening and the result was bolts of lightning from every plug in the house. We successfully treated this, but since becoming blind a few months ago this phobia has started again, and this time much worse. At the first storm he really battled and I was considering using vet medication to help him cope. I was then given a sample of the Avalon Pure Storm Fear Phobia Spray to try, and what a difference! At the last bad storm, in addition to the storm, some idiot had let off a bunch of big bangers in the street outside out home that sounded like gun shots. Normally he would have freaked - this time he lifted his head as if to say 'what was that' and then cuddled up again and went to sleep - no, he was not drugged - I checked! I have been experimenting with the best way possible manner to help dogs and have found that depending on the severity of the condition maybe only one of the following is needed, and in extreme cases, all are needed. Here is what I have been using and if you would like to purchase any, please just contact me. Additionally, anybody purchasing will be given full details on how to use, as well as notes on the behaviour modification aspects and a few basic TTouches you can use at home. I believe in always using as many tools as I can to help the dog. I am happy to keep in touch with these people by email to assist them if need be at no additional fee. This is a terrible condition for both dog and owner and I will do my utmost to assist. This is synergistic blend of phytogens and natures best prepared in a spray form and is totally natural and can do no harm whatsoever. The product is not sprayed onto the actual dog, rather in the air just above it so that the mist comes down on the dog. It can be sprayed in the room the dog is in, on its bed and with Brady; I sprayed a bit onto his Wrap before putting it on. The best results are achieved the very second you realize the dog is starting to stress or you see the sky darkening and spray immediately and also into the room where the dog is staying. As the storm (or fireworks start), spray above the dog again if needed. With extreme cases you may find that the dog will still run around, bark or similar, then spray two or three short bursts above the dog. This product works on an accumulative basis, and the more it is used, the quicker the calming effect. It should be stored out of the light. This is a Homeopathic Remedy and also totally safe. It should be stored out of the light and very few granules are used. The standard dose is 20-25 small granules and this does not change regardless with Minpin or Great Dane. For relief of anxiety and fear of loud noises especially thunder and fireworks in all animals and people. Start dosing as soon as anxiety starts with thunder or at sundown if fireworks expected. Dose to effect every 10-15-30 minutes initially until desired effect achieved. Then dose as necessary to keep the effect going every 1-2 hours or more often if needed. Very safe, overdosing not likely. The ideal situation is that a Homeopathic products should be be used 15 mins before or after a meal. Keep this product out of direct sunlight. 3. Wrap (or Thunder Jacket) - R550 - Wrap prices range from R55 for the 2" - R120 for the 6"
The Wrap is a wonderful tool to use to help the dog feel more secure. This should never be put on in that it is 'restrictive' in any way - rather it is applied just touching the skin so that it is comfortable. due to the stretchy material, it provided a light sensation of pressure against the body and moves slightly with the dog as it moves. It also provides a feeling of security. Should you wish to purchase all three of the above, instead of paying full price, we are offering a discount of 10% on The Avalon Pure Storm Fear Phobia Spray. Courier delivery in Gauteng is free for purchase of all 3 products as above.